I wrote about Alfalfa the Great Healer many years ago and the information still holds true today! 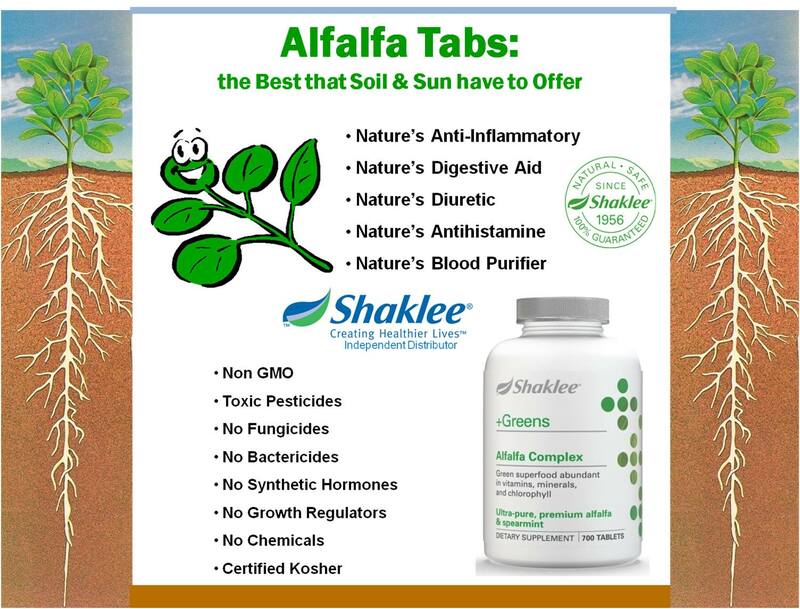 Alfalfa is abundant in vitamins, minerals, and chlorophyll, Dr Shaklee recognized the value of alfalfa, the roots of which burrow deep to reach minerals inaccessible to other plants. Shaklee uses ultra-pure, premium alfalfa, grown to maintain nutrient-and chlorophyll-rich leaves. Alfalfa complex contains NO fungicides, bacteriocides, synthetic hormones, growth regulators or chemicals. Alfalfa Complex is a Shaklee Signature Formula originally developed by DR Shaklee.